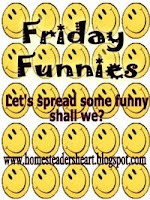 Stop and Smell the Chocolates: Friday Funnies ~ Nonsense? Now, you might not find this quite as funny as I do. I happen to think my kid is very amusing...but I am just a little biased. The other day, my son had to write a limerick for school. The first one he tried basically copied a nursery rhyme, so I suggested that he be more original and creative. His second attempt had him laughing so hard that he could hardly read it to me. It was total nonsense! It included things like Jupiter, tutus, buildings, nieces and phrases like "lava stew" - Ummm - do those go together? I suggested that this particular limerick was quite silly and that I didn't know if it was being graded. Did he want to risk being marked down for nonsense? Yes, he absolutely did. Sigh...OK.
Later, he called out from his bedroom, "Mom, I fixed my limerick so now it makes sense!" A feeling of pride welled up in me as I thought of my son deciding to take my advice and taking it upon himself to redo all the lines of the limerick. He ran in with the "fixed" poem. "See? I gave it a title: Senseless. Now it all makes sense!" Okay kid...you won this round. ~ Never answer an anonymous letter. ~ I don't suffer from insanity; I enjoy every minute of it. ~ Borrow money from a pessimist - they don't expect it back. I think that your sons "fix" was brilliant. How funny that he would think of that huh? Thanks for linking up my friend. I've got to go post my recipe now. I'm with Kim...how brilliant to go from sense to senseless and make perfect sense! Not only do I think he was "creative" in fixing YOUR problem with his poem, but I love how creative he is with the pen. Never answer an anonymous letter, that is so funny. And my favorite I don't suffer frm insanity; I enjoy every miute of it...he has a future writing for Jay Leno! Good fix! Loved the oneliners, too. Great oneliners! He is funny! I love being in the passangers sit in the drive thru & telling the driver to let them know it is "to go". I am not really sure why that makes me smile & laugh, but it does. Your son is brilliant btw. Did he ever fix it? This is precious!!!! I got a good chuckle out of it!